The quantum picture of the world is confusing at best. While classical physics (i.e. Newtonian physics) governs many laws of nature for everyday objects, quantum mechanics can be used to accurately predict the behaviour of objects on much smaller scales - down to the scale of an atom. In quantum mechanics, electrons and other subatomic particles cease to exist in a specific place at a specific time, and instead exist in a sea of probability. Quantum mechanics explains some odd occurrences of smaller particles – like wave-particle duality. The conventional interpretation of the quantum world was brought about in the 1920s, put forward by the physicists Bohr and Heisenberg. This interpretation, also known as the ‘Copenhagen interpretation’, explains how a particle does not exist in one state or another, but in fact exists in all possible states at once. It is only when we observe the particle that it then effectively must select one of these probable states, and this is the state that we observe. This view of quantum mechanics explains that we live in a single universe, where there are essentially some exceptions to the laws of classical mechanics. Although this is the theory that has been taught to physicists for several decades now, a recent article in New Scientist magazine suggests that physicists are still in considerable disagreement about what the quantum world looks like. Many physicists are not in favour of the Copenhagen interpretation, and look to alternative explanations instead. You might have heard of a famous theoretical experiment related to Schrodinger’s cat. In fact, this well-known experiment was thought up by the physicist, Schrodinger, whose equations form the fundamental basis of the conventional theory of quantum mechanics. The Schrodinger equations predict outcomes of quantum mechanical experiments perfectly. But his Schrodinger’s cat experiment can be argued as opposing the Copenhagen Interpretation itself. Schrodinger thought of putting a cat, some radioactive material, and a Geiger counter inside a box that would be sealed shut. (Bear in mind, this is just a thought experiment, and no cats were harmed.) The Geiger counter – an instrument that detects radioactivity – would be designed to trigger the spillage of an acid that would kill the cat. An important thing to mention here is that radioactive decay, which would trigger the Geiger counter and ultimately kill the cat, is inherently random – so the cat’s fate is unknowable. While the cat is kept sealed inside the box, it is impossible to know if it is alive or dead without opening the box and observing it. Until such an observation, it could be said that the cat exists in a simultaneous state of life and death. This goes back to the conventional (Copenhagen) interpretation of the quantum world, which explains that a particle effectively exists in all states at once – referred to as the quantum superposition principle - until it is observed and collapses into a single state (see Figure 1). While some argue that the Schrodinger’s cat experiment proved his belief in the Copenhagen picture, others believe that his whole point was that quantum superposition is impossible – how can the cat be alive and dead at the same time? Some physicists consider this to be Schrodinger’s explanation for the inherent flaws of the Copenhagen interpretation. Of course, this is just a drop in the water of the reasons that led physicists to start considering alternative theories of the quantum world. Figure 1. The quantum superposition principle states that an object exists in all possible states at once. The wavefunction, or total of all these possible states, collapses into a single state upon observation. A popular alternative theory of quantum mechanics is the many-interacting worlds interpretation, which was recently put forward by Howard Wiseman and colleagues in 2014. 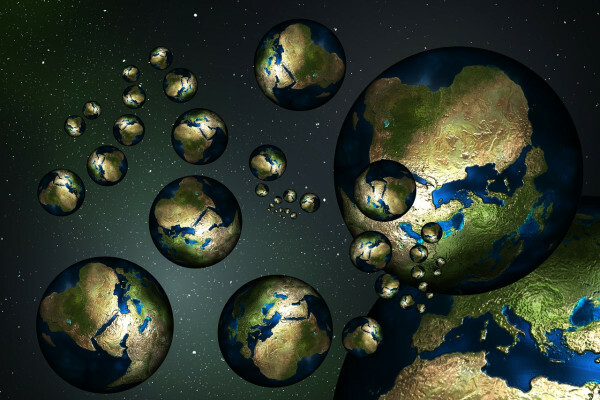 The parallel worlds idea has been around since the 1950s, hypothesised by physicists like Hugh Everett and David Deutsch, but this new proposal makes the multiverse theory more likely. Wiseman’s view is that there are a huge, but finite, number of ordinary parallel worlds – and that it is the mild interactions or bumps between these worlds that explains the odd incidences ascribed to quantum mechanics. In his favour, his team seem to have mathematical proof and reproducible results, involving the renowned double-slit experiment. The theory cannot so far explain all quantum effects, particularly a phenomenon called the entanglement of states, but it is considered by many physicists as an interesting proposal. Wiseman even points speculatively to the possibility of communication between the worlds. If nothing else, this theory could at least promisingly simplify complex quantum predictions. For philosophers, the many worlds theory is unsettling – it could mean that there are countless versions of ourselves in different timelines. It also brings up much debate about free will; if all possible choices of a decision have been carried out in alternate worlds, then do we really have free will, or is our path in our own timeline just predetermined? While for now it is unlikely that scientists will be building transportation devices that allow us to travel between parallel dimensions, with this new proposal there certainly seems to be some scope for physicists to come up with a complete alternative theory for the quantum world. It might even be a theory that a majority of physicists can finally get on board with.